Jirra is a name for Both (Male and Female) originally come from Australia that means A kangaroo. This name have 5 characters, start with letter J and very popular in Aboriginal people. You can use Jirra for baby name, business company name, user id, nick name, and more. Conclusion : The meaning of Jirra is A kangaroo (in Aboriginal). I wanted something distinctly Australian and we have had a Jedda and a Jindi in the family back home. Jirra is full of beans, is settling in very well indeed and at just shy of 8 weeks she is showing she is no slouch in the smarts department. Using the clicker and rewards, she is already coming to both her name and/or a whistle,sitting, downing, does a mean mini-stay and is already walking on quite well on leash. She is EXTREMELY patient with Angus and seems to know intuitively that he is a little tyke like her and so he is off bounds for nipping and chewing on. Grace however is fair game and they love to chase each other around the house. Jirra is crating next to me at night which has driven the wife from the room ” I wont be back until that dog goes outside !” and that suits me…..I love a king sized bed to myself. We have given her the first round of vaccinations and worming and it will be good to get her outside and into the real world. This will happen just in time for the move to our FABULOUSLY AMAZING new villa……stay tuned for more on that one. Thanks Cindy. I started training her the moment she got home and after the first day I was fretting thinking “she is never going to be another Karma” cos she seemed a bit slow on the uptake but now – after a week of training……she is right on track ! Poor little thing- I didn’t give her much of a chance 😉 Jirra has a spunky little personality and at not even 8 weeks she is doing incredibly well with clicker training. I think she is going to be MUCH bigger than Karma and I cannot wait till the ears go up so I can get a good look at her. 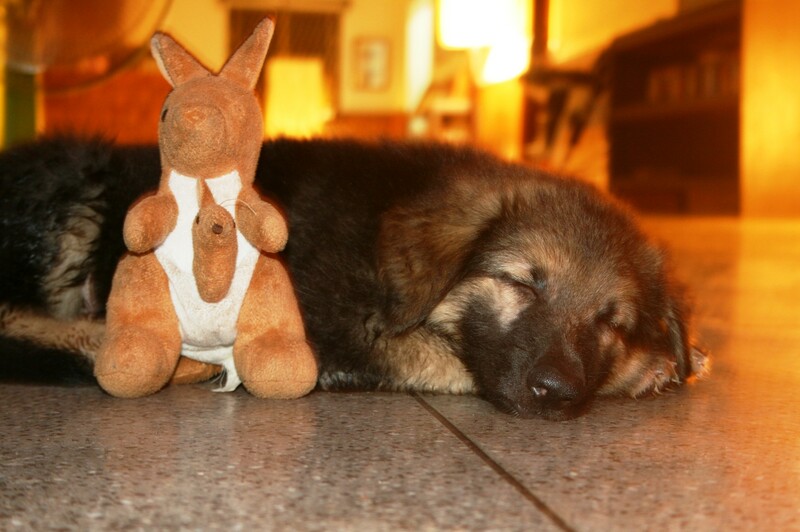 Its just so awesome to have another GSD again. Wasn’t she a little younger than Karma when you brought her home? I don’t know how you’ve lucked out with such great pups considering the availability. Yes….Jirra is only slightly younger than Karma when she came home. We have a long way to go with Jirra to say I lucked out the same way as Karma though. Jirra is high drive, high energy and she is going to much bigger than Karma so I am watching with inteterest. So far so good though. Jirra has already started doing an amazing focus on me as she trots beside me on leash . But yes….given availability of GSDs here in Cambodia….seeing Jirra’s litter when I walked into the house was like seeing water in the desert. Hi! My name is Alison, and my family and I are Americans living in Cambodia. We too have ben looking for a German Shepherd in Cambodia. Can you pleasegiveme any information about where we can find one? Also, how much did you pay for your puppy? Thanks so much for your help! Can you please send me an email address and I will give you the info I have.